The upcoming steel fabrication trade event – SteelFab 2016 – is promising the regional industry robust growth in new content, a rise in foreign participation and a new concurrent show. The 12th edition of the region’s definitive trade exhibition targeting steel fabricators and the metal working and metal manufacturing industry will be held at Expo Centre Sharjah from January 17 to 20. SteelFab 2016 is likely to feature more than 370 exhibitors representing nearly 1,000 brands from across the world, besides new special focus areas, special pavilions, live displays, technical seminars and product presentations. “The regional industry is once again expecting a comprehensive edition of SteelFab. 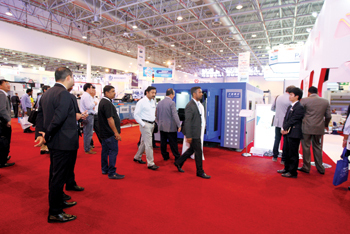 At SteelFab 2016, it can explore one of the biggest showcases of cutting-edge equipment, advanced technologies, new products and applications for all its metal forming, fabricating, welding and finishing needs,” said Saif Mohammed Al Midfa, CEO, Expo Centre Sharjah. 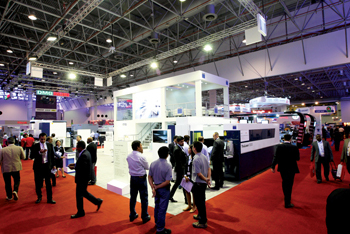 Prominent among the new additions to SteelFab 2016 is a new vertical – Fasteners World Middle East – which will be a dedicated trade fair for the fastener and fixing industry. As a precursor to Fasteners World ME, a fasteners’ pavilion was introduced during the previous show, which successfully paved the way for the launch of the new concurrent show. Increasing foreign participation has always been a strong point of SteelFab and this has been underscored by the confirmation of the German and Taiwan pavilions of their participation at the show. “In coordination with the Association of the German Trade Fair Industry (AUMA) and the German Engineering Federation (VDMA), a large number of exhibitors have already confirmed their presence in the German Pavilion. The Taiwan Association of Machinery Industry (TAMI) will be facilitating the participation of leading machinery makers at the Taiwan Pavilion,” added Al Midfa. As well as Germany and Taiwan, there will be strong participation from Italy, Turkey, China and India. During its previous edition, SteelFab featured 22 stalls in the German Pavilion, There were more than 30 Italian exhibitors and the Taiwan Pavilion had 16. This time, the German and Taiwan pavilions will be featuring 24 and 20 exhibitors, respectively. “New technology and machinery have always been a mainstay of SteelFab and this year too visitors can expect some of the latest innovations from world’s leading manufacturers and dealers. Besides, the number of new exhibitors has gone up by about 15 per cent already, thus confirming that new content is set to grow in space by more than 25 per cent,” added Al Midfa. SteelFab 2016 will also see the launch of a new special focus area: Wear Resistant and Hard Facing – Cladding. The new segment will help regional fabricators to optimise their production for fabrications used in rigorous environments such as construction equipment, municipal equipment, recycling, quarries, cement industry etc. The regular special focus areas such as Welding and Cutting, Machine Tools and Pipe and Tube Machinery will continue to be major attractions.